The post is heavily backed up with links to supporting news items; well worth a look. The former Italian Prime Minister, an Italian judge, and the former head of Italian counterintelligence admit that NATO, with the help of the Pentagon and CIA, carried out terror bombings in Italy and blamed the communists, in order to rally people’s support for their governments in Europe in their fight against communism. "With fear as their greatest weapon, the plan is to engineer events, real and staged, that will create enormous fear in the countdown years to 2012. This includes a plan to start a third world war by stimulating the Muslim world into a 'Holy War' with the West, or by using the Chinese to cause global conflict. Maybe both." Anyone who has become involved in the 9/11 Truth or Patriot Movements has more than likely heard the phrase "false-flag" when terrorism has been discussed. If it was left up to those traitorous elected officials, the public would have never heard of this term, nor would they have heard the term "domestic terrorism" as well. This is true, because an uneducated public is much easier to fool than a public that is informed and comprised of an activist citizenry. False-Flag Terrorism – Terrorist acts that appear to have been carried out by a certain group or nation, who are quickly named as the responsible party or parties, when in fact, the terrorist event was carried out by another group entirely. A perfect example of false-flag terrorism could be found within the 9/11 false-flag event. It was blamed on Osama Bin Laden and nineteen Arab hijackers, when there is plenty of evidence pointing to 9/11 as an inside job. The terror incident or attack can be stated in terms of the Hegelian Dialectic, which is now more commonly known as Problem-Reaction-Solution. The recent experience in the USA has been that these terrorist atttacks have been used as an excuse to take away freedoms previously enjoyed by every American citizen, as heinous laws such as the USA PATRIOT ACT are passed for our own good, which has NOTHING to do with patrotism, by the way! Aspects of the attack draw upon tried and true methods of past attacks. Whether this is part of the attack itself, the propaganda surrounding it, or the desensitizing and preparation of the audience, the current attack will seem familiar, as it mimics aspects of past attacks. An example of this is the manufactured strife in the Gaza Strip area, between Israel and Palestine. Another example of this are the 1993 and 2001 World Trade Center attacks, which were horrible incidents of mass murder, and the 2001 attack was perhaps the largest-ever case of insurance fraud. Documents released in the late 1990's via the Freedom of Information Act show that Oswald was employed by the CIA, and was acting on their behalf as a PATSY on November 22, 1963. This, of course, was not mentioned, which provided the JFK public execution with the very definition of a coup d'etat against this nation. Also not mentioned was the fact that those whose passports were allegedly found in the street after 9/11, were working at Pensacola Navala Air Station, and under the purview of Naval Intelligence. In the case of Timothy McVeigh, who hails from the Buffalo, New York USA area, his execution appears to his family to have been a staged event. After speaking with a member of his family, I was told that he was taken into protective custody, had since been given plastic surgery, and he now lives and works somewhere in South America, where he is known by another name and background. No member of his family had gone to the execution, and this is because they were told by McVeigh NOT TO ATTEND. I believe this family member more than I believe the government of McVeigh's fate. Like Oswald, he too had begun work in the military intelligence community. 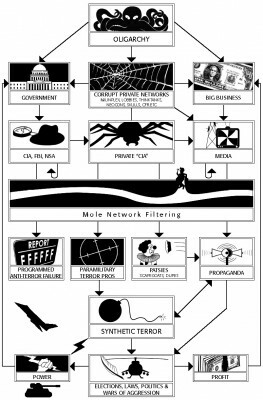 In the second part of this investigative article, I will delve a bit deeper into the subjects briefly covered in part one, with an emphasis on HOW these false-flag terrorist systems work in the real world. It is my hope that after reading both parts of this important article, you will NEVER AGAIN mistake a false-flag operation for the real thing. That is, IF there is such a thing as REAL terrorism! Georg Wilhelm Friedrich Hegel (1770-1831); German philosopher. The Hegelian Dialectic is a method by which the globalists rule a target population by fear. Restated simply as Problem-Reaction-Solution, it is a three-stage formula, by which an artificial problem is created, which enrages the public. The public then demands that "something MUST be done". The third stage, which is a pre-fabricated artificial solution, would never have been accepted, had that artificial problem NOT previously existed. But, the solution IS ACCEPTED, simply because the public has been traumatized and placed into a state of heightened suggestability, by the constant replaying of news footage of the attack. With the public placed under a state of fear, they would do almost anything, and agree to almost anything to alleviate the problem under which they had been currently suffering. PROBLEM - In the first stage of this process, an artificial problem is created, because without a problem, there can be no solution. Both sides of the conflict are controlled by the same globalist group, so the outcome can also be controlled and manipulated, delivering whatever results are most desired by the traitors. The first and single most important aspect of this is to control all public debate. This is done by controlling the mass media, and especially whom it is that gets access to and appears on that mass media. Any point of view that has been found to be antithetical to the establishment's official-fiction of the event is NOT allowed access to the globalist owned and controlled television, radio, and print media. If these people were as smart as they are greedy, they would put someone like Alex Jones on TV regularly, because someone like him would fill the need to provide a talking head to feed into the conspiratologist mindset. You know them, these are the tin-foil hat wearing paranoid kooks who believe in such nonsense as lizard-people from the thirteenth dimension, and who have possessed our leaders in Washington, DC. Alex Jones could fill in a demographic that is not being represented in today's newscasts, and this is one reason why ALL mainstream media outlets have been losing viewers, listeners, and their readership. In fact, most people I know have stopped watching the news on TV altogether. By literally turning off CNN and others of its' ilk, I have been able to clear my mind of all the negative mind-control based manipulation that takes place through the television. This has helped me to better concentrate on my research-journalism, without worry of competition from the propaganda-based mass media. However, the one thing that I can say about ALL serious Internet Researchers, is that WE certainly know our subject matter! Perhaps, this is WHY the propagandists hesitate to put an Alex Jones on television, because in the March 23, 2006 aftermath of the Charlie Sheen 9/11 revelations, Mr. Jones made his CNN commentator look like a fool! REACTION - Once public outrage over the false-flag attack has been fomented, the public then demands that something must be done to deal with or solve the problem. In the second stage of this process, public outrage is whipped up by the most heinous acts imaginable. In April 1995, the Oklahoma City Murrah Building was destroyed by a series of demolition shape charge devices, which was said to originate from a single fertilizer bomb from a truck parked outside the front door of the building. However, the type of fertilizer bomb described by the government in the news media, cannot bring about the level of damage as had been done to the building on that day. Clearly, the blast originated from WITHIN the building, and the blast flew outwards from the building, and NOT from the outside in, as the government asserted. And, who says this was a series of demolition shape charge devices? Why, no less a source than Brig. Gen. Benton K. Partin, in his report entitled 'Bomb Damage Analysis of Alfred P. Murrah Federal Building, Oklahoma City, Oklahoma' which was dated July 30, 1995, a copy of which I have in my possession. The General's report was much more belivable than the government's own report on the bombing, and for his troubles, he was completely ignored. The photos that Gen. Partin included in his report, exhibited the damage from an outward blast! Because a children's day care center was among the victims of that false-flag terrorist attack, the public became highly upset, playing right into the hands of the REAL terrorists. The requisite patsy, Timothy McVeigh, along with his two alleged accomplices, Terry Nichols and Michael Fortier, wre immediately named as the responsibile parties, within hours of the bombing. This was SUPPOSED to be a psy-op to demonize the Patriot and Militia movements in this country, but, as far as I can tell, all it did was further encourage both groups, as most intelligent people saw straight through the ruse. There were Arabian-looking people who were caught on the various security videotapes located in downtown Oklahoma City, who were filmed leaving the scene with McVeigh, and this was the reason WHY those videotapes were never released, and shown to the public on the various news channels. Remember this rule -- if it benefits the official-fiction, it is shown ad nauseum -- but if it does NOT benefit the official-fiction, it is lost, destroyed, or locked up DUE TO REASONS OF NATIONAL SECURITY. Whenever the reader hears this FOR REASONS OF NATIONAL SECURITY code phrase, it usually means that a crime has been committed, one that needs to be BURIED. SOLUTION - The public decried the OKC bombing, which quickly lead to the third Solution stage of the Hegelian Dialectic. A law entitled Anti-Terrorism and Effective Death Penalty Act of 1996 was later passed, becoming Public Law 104-132, on April 24, 1996. The bill was sponsored by Republican Senator Robert Dole only one week after the bombing, on April 27, 1995. Within one year, this bill had become law. In this OKC example, this new law eroded civil-liberties and established a weakened Habeas Corpus, limiting such actions to a one-year statute of limitations for State prisoners. This solution was one that never would have been tolerated or accepted by the public, had the bombing not took place. In addition to Habeas Corpus 'reform,' the law also established justice for victims of terrorist acts, and it revised the Federal criminal code provisions involving nuclear, biological, and chemical weapons. This law would later form the legal foundation and precedence upon which the USA PATRIOT ACT was constructed. I will remind the reader that the PATRIOT ACT is an acronym; Uniting and Strengthening America by Providing Appropriate Tools Required to Intercept and Obstruct Terrorism, and has NOTHING to do with patriotism beyond the enflamed nationalism hinted at by the acronym itself! The name of this freedom-destroying law was reminiscent of the legislation that Hitler had passed in 1933, shortly after the self-inflcited Reichstag fire. The name of the Nazi law was The Law to Remove the Distress of the People and the State,' also known as 'The Enabling Act,' and shortly after its' passage, the German government qucikly developed into the THIRD REICH. Another similarity is the Neo-Nazi-Con regime that has assumed dictatorial control in AmeriKa today, quietly refers to itself as the FOURTH REICH. "First of all, most of this, like ninety-percent, is no theory. It's supported by the evidence. Secondly, I am NOT talking about a conspiracy, I am talking about an agenda! The implementation of this agenda has three parts. First, conspiring to remove those people and organizations that are a threat to the agena becoming reality. Second, conspiring to place into power, those who will make the agenda a reality. Third, conspiring to create events in the world, like wars and Oklahoma City, to manipulate the population through Problem-Reaction-Solution to DEMAND the agenda becomes reality, or see it as the ONLY solution to the problems they are faced with." --- David Icke; Ruled By The Gods; March 25, 2000 (Part 5 - 30:14 to 31:00). The quote above was a most clever elucidated description of Problem-Reaction-Solution, how it works, and its' effect upon the target population, as seen through the eyes of its' global managers. WHAT EXACTLY IS THIS GLOBAL AGENDA, ANYWAY? Privatization of government military programs, with the same handful of companies getting the contracts over and over again, merging the government with the Military-Industrial Complex. World population lowered to 500 million or less. With the global population currently at 6.5 BILLION, this would be a drop of 90%! This means that 90% of everyone YOU KNOW will fall victim to this evil plan. Do YOU know what you need to know in order to survive? Or, are you hoping that this shall never come to pass? A World currency and world banking system. World community and citizenry, with the complete destruction of individual nation-states. Fascist-based military rule by United Nations military forces. Microchipped population, with brain implants. A new global religion, based upon Luciferian principles and Astro-Theology. Mental health screening of every citizen, with mind-control programming for those who resist the New Order. Introduce a world authoritative body known as the United Nations, with associated bodies such as the World Trade Organization, the World Health Organization, and the World Bank. These bodies were planned to evolve through the process of GRADUALISM, into a world government and military, with the power to control the lives of everyone on the planet. Continue to cause conflict across the globe through engineered wars and conflicts, and the creation of an EVIL ENEMY -- the only solution for which was the rapidly expanding defense industry -- and to protect the citizens from these conflicts, the North Atlantic Treaty Organization (NATO) and the United Nations 'peace-keeping forces' (UN) was set up. Eventually, these will be fused together and will form the basis of the World Army. The creation of three 'free-trade' unions in the Americas, Europe, and Asia, which were originally sold to the public as being all about free-trade and business. Eventually, as the European Union has shown us, these will be evolved into centralized political unions, with a central political system and a single currency. The North-American Union (or Pan-American Union) is rapidly following the lead of Europe, and STILL, most of our friends, family, and co-workers are none for the wiser concerning these matters. The rapid influx of illegal immigrants in the USA is being done ON PURPOSE to aid this process, and also to destroy our national sovereignty. National sovereignty MUST be destroyed before anything further can be done to bring these globalists desires closer to fruition. This is WHY the Patriot movement is so threatening to these people. Advance the control of public thought and opinion, and to further advanced studies on how to manipulate the human mind, both on an individual level and on a collective, societial level. The ultimate extension of this part of the agenda includes the microchipping of ALL HUMANS, and connecting them to a global computer network. This computer network is known as the BEAST NETWORK, and everyone on the planet is identified by an eighteen digit number, which is organizaed in three groups of six digits, i.e. 666. The BEAST New World Order Mainframe Computer Network is the central tracking computer network of the New World Order. 666 also forms the three lead-off digits for every persons' number, thus identifying from WHERE the data originated. Each code number consists of the aforementioned 666 + 3-digit country code + telephone area code + social security number = BEAST ID #. Let's say that you live in the 202 area code, which is Washington, DC (just a coincidence! Nothing to worry about!). And let's say that your Social Security Number is 123-45-6789. The code for the USA is: 110 (the binary equivalent of the number 6). Thus, your BEAST ID # would be: 666110-202123-456789. By the way, the names of the software that runs on the BEAST Computer Network provides evidence of the Globalists' fanaticism for symbolism; HELL, INFERNO, LUCIFER, SATAN, DEMON, and the Central Mainframe Core is referred to as the GREAT BEAST. According to inside sources, BEAST itself is an acronym, which is: Battle Engagement Area Simulation & Tracking, and was built upon Bill Hamilton's PROMIS software, which the Federal Government stole during the 1980's, from INSLAW Corporation. The microchip is known by the public to be the VeriChip. However, internally it is known by the following acronym, MARCC, which stands for Multiple Readout Automated Computer Chip. Therefore, anyone who will be forced to take implantation of this chip will truly be receiving the MARCC of the BEAST! Build up and construct a welfare state, creating dependency upon the FedGov for the monthly stipend. Once this dependency has been determined to have reached the ultimate societial saturation point, the welfare benefits will be taken away, which will create an underclass without help nor hope. The first step in this direction was the WORK FOR BENEFITS programs, which have been recently implemented in New York State (where I live) and others. To create uncontrolled indebtedness on the part of the public, by making loans and credit cards easy to obtain. The media plays a role in this, by the conspicious consumption society, eventually, people will be so far in debt, that once the time comes, it will be relatively easy to take everything they THOUGHT they owned! This has also been done to businesses; as well as local, town, city, county, and state government levels -- which has created a tremendous debt burden. As above, once the time comes, the FedGov will come calling, and out of BANKRUPTCY, it will be easy to merge these lower levels of government. This is currently underway in my area, as BOTH the City of Buffalo and Erie County are hopelessly bankrupt. However, there is vociferous opposition to this so-called bail-out plan. To make outrageous amounts of money for the elite-backed powerbrokers, who make a profit whether the markets move up or down, and whether entire nations prosper or collapse, THEY still make their money! Nero Cladius Caesar (July 18, 64 AD) - On this night, a fire started that would eventually burn to the ground, three-quarters of Rome. As history tells us, Nero fiddled, while Rome burned. Nero had his guards patrol the streets, making sure that all efforts to stop the fire were themselves stopped. The flames were fanned by men throwing torches into the blazing fire, saying "all they were doing was following orders." It is not clear if it was Nero who started the fire, or prevented it from being put out. But, in the end, it didn't matter. What was left were the charred remains of a city and a people who were once vibrant and had the power to rule the world. On September 11th, it was Nero, whom George Bush Jr. most represented when he sat there in that classroom, reading the story of the goat (which itself symbolized Baphomet). Nero blamed the fire on the Christians, but it was he who had the most to gain from the fire. As soon as the fires were finally put out, Nero rebuilt the city of Rome the way he wanted it to be. The poor Christians were thrown to the lions, and became the preferred sport of the new city. But something did not make any sense. Why would a city of poor people burn down their own homes, instead of Nero's palace? Always remember this: "He who stands to gain the most from a terrorist act, is the most likely person who brought that plan to fruition." The dead Christians became martyrs, and this allowed a groundswell to develop against Nero, who finally 'committed suicide' four years later. His victory was short lived, and after the good people of Rome began to sympathize with the martyrs, Nero's entire empire crumbled after his so-called 'suicide' of 68 AD. Bibles were confiscated, then burned. Christian churches were burned down. Christians were sacrificed to the heathen pagan gods; and became 'entertainment' in the Roman Coliseum, where they were thrown to the lions, and were torn limb from limb. This was a terrible time to be a Christian, and one can hear the faint footsteps of jackboots -- as they are coming for the Christians again in the nascent 21st century! Adolph Schickelgruber Hiedler 'Hitler' (February 27, 1933) - In February 1933, Adolph Schickelgruber 'Hitler,' Joseph Gobbels, and Herman Goering came up with a plan to guarantee them victory in the upcoming March 1933 election. They set about a plan to burn down the Reichstag, which was the German government and parliament building. The fire was set by a mentally disabled man named Marinus van der Lubbe, who had been seen around town since several days earlier, trying to set fire to different government buildings. van der Lubbe was never stopped, questioned, or arrested by the German police, and was left to go about his business unfettered. "restrictions on personal liberty , on the right of free expression of opinion, including freedom of the press , on the right of assembly and the right of association , and violations of the privacy of postal, telegraphic, and telephonic communications , and warrants for house-searches , orders for confiscation as well as restrictions on property , are also permissible beyond the legal limits otherwise prescribed." The fire was blamed on the Communists, and this allowed 'Hitler' and his Nazi thugs to seize control of the government for themselves. With only 44 percent of the vote in the March 1933 election, 'Hitler' used his emergency powers to throw out anyone who disgreed with his policies. In doing so, he was able to capture the entire country, and set about a Satanic occcult-based government structure that would become known as the Third Reich. Perhaps the most startling revelations to come about 'Hitler' were the two stories, one confirmed, the other unconfirmed. The late professor Antony C. Sutton wrote a book entitled 'Wall Street and the Rise of Hitler,' where the American finance and banking community was found to be the power and the money BEHIND 'Hitler" in his endeavors. For his part in this story, Bush Jr's grandfather, Prescott Sheldon Bush, was heavily fined and imprisoned for breaking the TRADING WITH THE ENEMY ACT. The link for this book is below, and it makes for some rather disturbing reading. As it turns out, 'Hitler' was obsessed with St. Crispin, and the Krespi alias was given to him in 1943. This is NOT disputed by anyone. In part three of this investigative series, I will concentrate solely upon the false-flag attacks carried out by factions within the United States government, against her own people. The sources for these examples have come from declassified reports, freedom of information filings, and sources who have told the truth under pain of reprisal. It is my hope to educate the public on these matters, to do my part of debunking the 'outside threat' myth. NOTE: Click on the above chart to enlarge graphic. The chart above shows the inter-relational structure of the prototypical typical false-flag domestic terrorist attack network, Al-Qaeda. However, in the 1980's when the Afghan rebels were fighting Russia, the Al-Qaeda terrorist network was known as the Mujahideen 'freedom fighters.' As the Mujahideen, the Al-Qaeda terror network were portrayed as the GOOD GUYS. Once Russia had been dispensed with through the symbolic tearing down of the Berlin Wall, suddenly, the Mujahideen had become known as Al-Qaeda, and were now the manufactured BOOGEYMEN who allegedly carried out 9/11, with nothing more than a notebook computer from a cave somewhere in war-torn Afghanistan. The United States, at the behest of their globalist manipulators, have carried out many false-flag attacks throughout our nations' history. Below, I have selected a few of the most memorable events, which were ALL carried out by forces from within the USA, or controlled by forces from within the United States. To help identify those responsible parties, it is pertinent that one observes the career trajectory of those in close proximity to the attack, immediately after the attack has taken place. Several political figures at center stage on 9/11 are now on the national stage: Rudy Giuliani, George Pataki, and Hillary Rodenhurst Clinton. While I am not saying that any of these people were responsible, it is certainly within the realm of possibility that they knew in advance what was to occur. Giuliani's behavior on 9/11 was certainly suspect, as was Hillary Rodenhurst Clinton's.